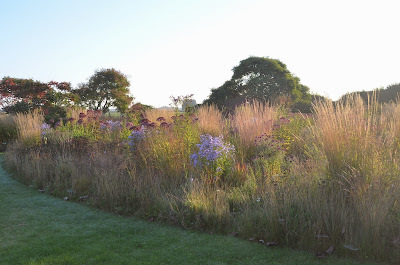 Some time ago I did a post on growing perennials in grass, actually the second most read posting I have done. This is something of an unrealisable holy grail for many of us, the idea that you can have roughish grass with wildflowers and perennials growing in it. 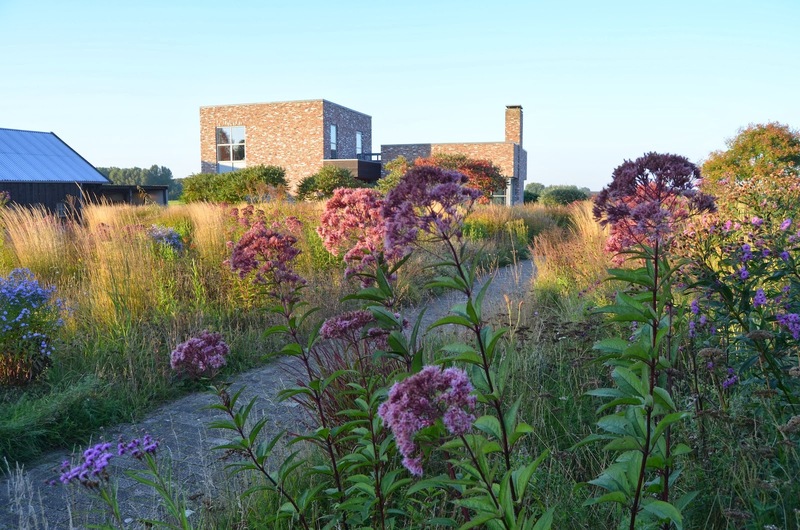 Our native grassland flora here in Britain and north-west Europe is very low on really bright ornamental species and there is so little that flowers after mid-summer. William Robinson suggested doing this in The Wild Garden, published in 1870, but he actually had very little experience of doing this when he wrote that book; in fact it was early in his career, and very much a rhetorical book rather than a practical one. It is a book which really does not deserve its reputation. The tough reality is that in our maritime climate with its long growing season it is very difficult to get perennials established in grass. Most ornamental perennials originate from more continental climates and do not grow until temperatures reach a certain level; consequently they are dormant for the winter. Our native grasses and a few wildflower species like creeping buttercup grow at lower temperatures, which effectively means off and on through the entire winter. 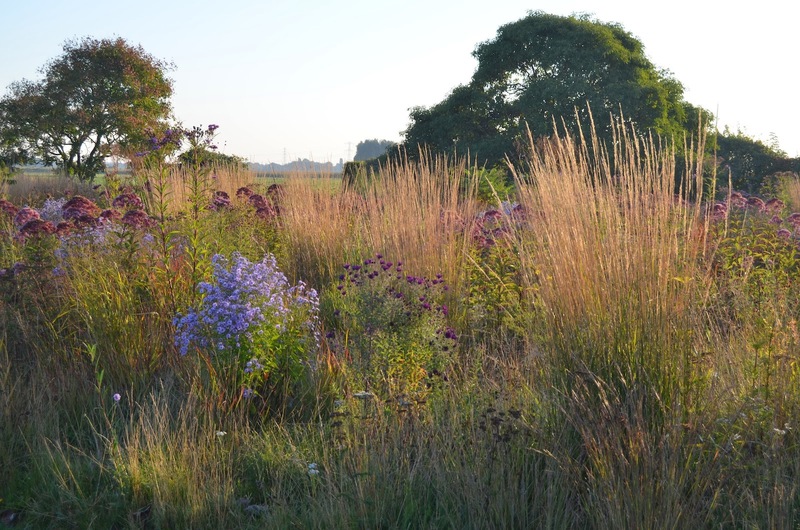 They inevitably take over so that any attempt at combining native grasses with ornamental perennials results in rough grass with steadily vanishing perennials. The only thing which can stop this happening is if they cannot get enough nutrients. Three years ago, in April, I visited the Oudolfs (who live in the eastern Netherlands) on a radiantly sunny weekend. Piet was setting out a new planting, on the site of the old nursery sales area, where plants were lined out in pots. 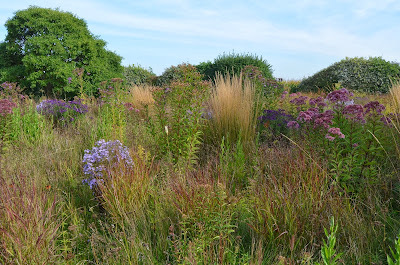 They had put down sand many years ago to provide good drainage and it was into the sand that some Calamagrostis 'Karl Foerster' and some perennials: heleniums, asters, eupatoriums, vernonias etc. were going. Piet told me he was going to sow the intermediate spaces with a wildflower seed mix i.e. mostly grass with a native forb element. I must say I was a bit sceptical. If I tried this at home, the grass would run rampant and swamp everything. But - three growing seasons later, it looks fantastic. Really fantastic. Really super low-maintenance fantastic. Piet has pulled it off, again! The perennials have all formed good clumps and flower well, although at a shorter height than they would do normally. The grass and wildflower mix has formed a dense sward but with a relatively low grass proportion. In fact a lot of it is yarrow (Achillea millefolium). It is very biodiverse - simply as a wildflower meadow it would be a great success. The reason must be the sand. Despite many years of having nutrients washed into it from the container plants in the nursery, it must still be very too low in nitrogen and phosphorus for grasses to be able to dominate. The result is a true and very rarely seen balance between perennials, with their clearly defined growing season, and grasses and other wintergreen species, which can grow all year round. It really is a triumph, and illustrates very beautifully and dramatically that we must not give up on trying to achieve perennial meadows. Substrate is clearly everything, which is good news for those on sand, or post-industrial waste! 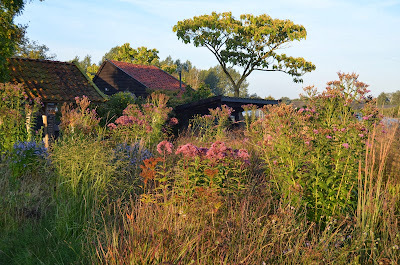 The rest of us, on the fertile and moisture-retentive soils which gardeners and farmers have traditionally regarded as desirable, if not essential, can only look on in admiration. Or buy several lorry loads of sand. I am not sure of the sand depth here, my guess is probably 30cms or so. This may be important; many perennials are able to get their roots down deeper than our native turf-forming grasses, which are very superficially rooted and are therefore unable to access deeper nutrient and moisture resources. Another point on how to encourage perennials and forbs vis a vis grasses. I just saw James Hitchmough on a trip to Sheffield and he tells me that at the Olympic Park they had some marquees and other temporary structures covering ground over the winter. In the spring where the ground had been covered, the forbs grew very well, but much of the grass had died. Grasses have very little ability to store nutrients in their roots whereas most forbs do, and so they are at an advantage in this situation. Differential starvation. Mimicking, he says the effect of heavy winter snow, which is one reason why places like central European mountains and central Asia have such fantastic wildflowers and so little grass - so-called herb fields. Winter covers for wildflower meadows? Whole new market for geotextiles? Who knows. Try it and see. Hope springs eternal. I'll try sand. Very interesting... I had never really thought about why some concept such as these tend to work so much better in our continental climate here than in Western Europe, but it makes perfect sense. Quite inspiring. As one a little sceptical about the high maintenance requirements of Oudolf's work I am delighted to see he is promoting the concept of garden plants in grass. Many garden plants are superior sources of nectar and pollen for insects and I dream of seeing havens of such plants in the countryside. Not altogether sure I understand this. We planted into the original undisturbed 200 year old grassland (pasture) - here http://veddw.com/south-garden-wild-garden-headstones/. Just took choosing things which are vigorous enough to compete. Did you mean planting into grassland with just British natives? There are, of course, quite a few of those happily co-existing. (some commonly known as weeds) (like my favourite willow herb)But they were already there..
Having a garden on sandy land in the outskirts of Berlin, I agree with your statement that substrate is 'clearly everything' on land with 'post-industrial' waste'. While valued perennials such as Delphiniums are failing here, grasses, like Miscanthus , Calamagrostis ; Pennisetum combined with- Aster novae-angliae and Eupatorium are great also for my small garden.These plants in my mixed border look wild, but are not native..the only native ones here are agrimony, some sort of wild thyme and cypress spurge. 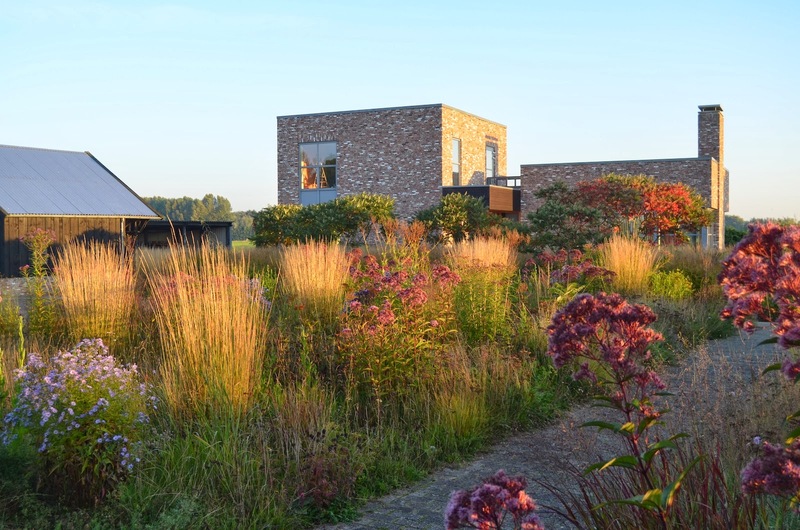 In Karl Försters sunken garden in Bornim (at Potsdam), which is only an hour's drive from my garden, you can still admire grasses and perennials living together in perfect harmony since years. I visit it regularly, the nursery next door is selling (for my happiness) still over 100 species and varieties of grass. Indeed most people by now believe that prairiegardens are of very high value for butterflies and other insects. Prceptions can deceive. The concept of Piet Oudolf was to create low maintance beautifull gardens en while they are really that, very beautifull often, the value for indigenous species of butterflies and also e.g. wild bees is often rather limited. Yes butterflies tend to be very opportunistic when it comes to obtaining nectar and therefore some of them use alien species for this, as a source, as easy as native plants. However many species do only so when easier sources are not available and some don't at all. Yes some of the polylectic bee (including bumblebees) species do have a similar opportunistic behaviour and use also aliens as a source of nectar, however many bee specie are oligolecic or even monolectic, which means that only very restricted plant resources are being used to collect pollen for the new generation. The grasses aplied in prairiegardens are mostly alien ( except of course when aplied in their original countries) and are therefore of no value as host plant to the caterpillars in contrast to the native grasses. Most other host plants for butterflies do hardly occur in prairiegardens, not even when they are acutally beautifull plants like e.g the hardy violets. Similary many of the very valuable plant species which are of utmost importance to keep the native bees species, e.g Campanulas are often not aplied. Moreover , the maintenance scheme of these garden of often not apropiate for the wanted wildlife species. 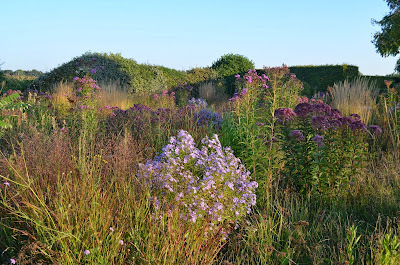 Please do not confuse a beautifull (prairie) garden for the eye with a garden which can be as beautifull but is at the same time designed to harbour as many species of wildlife as we can. A native meadow for example when not treated with fertilizers and with a well designed phased management scheme has far more value for butterflies and bees. A wel designed border could be too. It takes however a far wider study into the behaviour of butterflies, wild bees and other wildlfe to really achieve this goal. The prairiegardens where desigend with a totally other purpose. URGENT ACTION! The end of 95% of all nurseries?